Nismo has stated that only 8 F-Sport engines have been built. F-Sport GT Package aims to improve usability and driving by increasing displacement to 2.8L. F-Sport GT which realises a comfortable feeling which remarkably improves the power and torque in the low and medium speed range by 2.8 L, and is also suitable for everyday use. 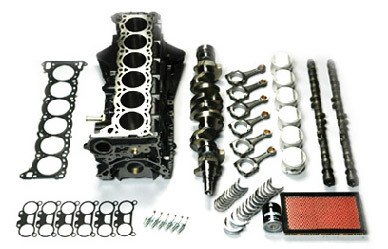 GT parts incorporated ensure superior strength and reliability. In addition, it measures flat performance as an update model of RB engine, but it is flat and easy to handle. In order to capture the power and torque created in by increasing displacement to 2.8 L, we adopted "Copper Mix Clutch Disk" using a phenomenal new material copper mix. It realises stable torque transmission and handling easiness not affected by thermal change. For ease of use in the city, "S-tune Height Adjustable suspension" is used. Since the height adjustment function of S-tune suspension is available, it is also possible to raise the car height, so we do not choose usage conditions. In addition, the wheel adopts the limited model of "LMGT4" which used gun metallic color with center lock, exclusive center package similar to GT race car, and expresses the status as a premium sports car. Like the steering wheel developed for Z-tune, it has a fine grip shape and uneven shape on the back. Black & silver two-tone color.